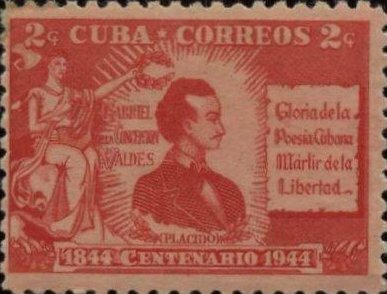 On this date in 1844, Cuban poet Gabriel de la Concepcion Valdes was executed in Matanzas for conspiring to overthrow Spanish authority on the island. His mother (who gave him up to an orphanage) was a Spanish dancer. His father (who adopted him back) was a “quadroon” barber. Valdes, aka Placido (Spanish link, which is true of most available online resources about him) grew up as a free mixed-race youth in a slave society. This situated him in the privileged (relative to plantation slaves) but precarious position of the petty bourgeoisie, menaced not only by the prospect of economic reversal but by the vicissitudes of Spanish policy towards his caste — whose growth many colonial officials fretted warily. Though Placido made his bread apprenticing as a print-maker and later making turquoise combs, he made his fame by dint of literary gift that was celebrated throughout Cuba and abroad. His “La siempreviva” won a literary competition when he was just 25, and led to an invitation to visit Spain (Placido declined it); the Cuban-born, naturalized Mexican poet Jose Maria Heredia visited Cuba in 1836 and made a point to look up Placido; and according to the out-of-print Cuba’s Romantic Poet: The Story of Placido by Frederick Stimson, the young Cuban was wildly popular with North American slavery abolitionists as well. Placido is less well-remembered beyond his home island today, but arguably rates as Cuba’s most distinguished Romantic poet. In the 1830s especially, when civil war in Spain put the reigning monarch on the liberal side, Placido was able to exploit the opening to write openly of Cuban political aspirations. His La Sombra de Padilla, dedicated to Spain’s “wise and exalted Queen”, imagines one of Spain’s martyred comuneros charging him to venture his life for liberty against absolutism. But notwithstanding the war in Iberia, the exalted Queen still put Cuba under special (read: repressive) law. Placido’s prominence, having advocated for much more freedom than Cuba was slated to enjoy, subjected him to automatic Spanish suspicion as more authoritarian governance arrived in the 1840s. The poet was arrested in the Conspiración de La Escalera (Conspiracy of the Ladder, so named for the structure its accused were tortured upon). This purported plot to raise a slave revolt may or may not (pdf) have really existed, but the crackdown it authorized sure did. Indeed, despite the “slave revolt” bogeyman, it was overwhelmingly free blacks whom the Spanish suppressed in this affair. Gariel de la Concepcion Valdes, known as “Placido”, was shot with ten others, “miserable instruments of the most depraved machinations of immoral men, men who deserve the curse of the living and the opprobrium of generations to come,” just a week after his conviction. In blood and terror goes my spirit’s life. Across my lyre to wake its dying strains. Faith’s mantle folds me to my slumbers holy. Mother, farewell! God keep thee — and forever! There are volumes of Placido’s poetry (in the original Spanish) freely available via public-domain Google books offerings here and here, with a short thumbnail biography here. For the nonfiction biographical exploration of Placido’s life, and detailed critical analysis of his poetry, this Vanderbilt master’s thesis (pdf) is highly recommended. This is very interesting, but almost impossible to read via tablet. Why wasn’t it made into a book?